And now for something a little less serious in comics… or at least, a lot more cute. 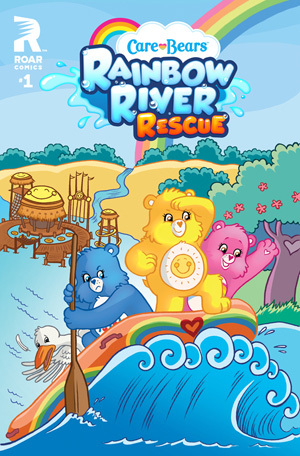 Lion Forge bring us the on-paper version of the latest Care Bares digital comic, Care Bears: Rainbow River Rescue. “When Wonderheart Bear finds an old map of Care-a-Lot, she takes her friends to a long-forgotten part of the Forest of Feelings, where Humming Storks like to nest. The Storks have all flown south for the winder, except for one baby bird who was too sick to fly and got left behind! It’s up to Funshine Bear, Cheer Bear, and Grumpy Bear to reunite their new friend, Dizzy the Humming Stork, with her family on Far-Flung Island, through whitewater rapids, falling rocks, a few wrong turns, and at least one wild Panthrokeet.” This full-color (of course!) graphic story collection was written by Georgia Ball and illustrated by Melanie Gillman. It’s available now.